The 140-kilogram Chang’e-4 mission rover Yutu-2. HELSINKI — The Chang'e-4 lander and rover entered sleep mode Monday (Feb. 11) in preparation for a second lunar nighttime on the far side of the moon. 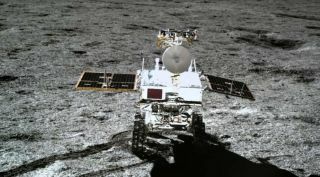 The Yutu-2 rover has accumulated 120 meters of driving on the lunar surface, surpassing the 114 meters of roving managed by the 2013 Chang'e-3 mission rover Yutu ("Jade Rabbit") before it became immobilized in its second lunar daytime. Yutu-2 has been upgraded for improved reliability to address the issue with the first Yutu rover. The new rover has a design life of three months, after which a joint Netherlands-China low frequency radio astronomy instrument (NCLE) aboard the Queqiao ("Magpie Bridge") Chang'e-4 relay satellite will begin operations. The rover's science payloads — the Lunar Penetrating Radar, Visible and Near-Infrared Imaging Spectrometer, Advanced Small Analyzer for Neutrals, and Panoramic Camera — were reported to be operating nominally and with good data transmission. Image of the Chang’e-4 lander taken by Yutu-2, released Feb. 4, 2019. The previous lunar night saw the Chang'e-4 lander record a temperature low of -190 degrees Celsius (-310 Fahrenheit), with measurements made possible by a Russian-developed radioisotope thermoelectric generator which also acts as a prototype for future deep-space exploration. The NASA Lunar Reconnaissance Orbiter passed 330 kilometers east of the landing site on Jan. 30, returning an oblique image of the Von Kármán crater and the Chang'e-4 lander, before later also isolating the rover within the image. Chang’e-4 lander (near tip of left arrow) and rover (right arrow) among craters on the floor of Von Kármán crater in a 1,700-meter-wide image. A more vertical view of the spacecraft and landing site was likely imaged in a following orbit using LRO's LAMP instrument. That view could be released, along with any significant findings on how lunar dust is ejected upwards during a spacecraft's landing, during the 56th session of the Scientific and Technology Subcommittee meeting of the UN Committee on the Peaceful Uses of Outer Space, which opened Monday in Vienna, Austria, and runs to Feb. 22. The far side of the moon, with Earth visible in the distance. Another component of the Chang'e-4 mission, the 45-kilogram Longjiang-2 microsatellite launched with Queqiao and operating in an elliptical lunar orbit, last week returned new images from a student-developed camera.